Suitable for measuring difficult shapes and sizes and capable of making up to 16 thickness measurements per second, the Magna-Mike 8500 handheld thickness gage uses magnetics to make quick, repeatable measurements of non-ferrous materials. A magnetic probe is held on one side of the test material and a small steel target ball is on the other. A Hall effect sensor in the probe measures the distance between the probe tip and the ball, which provides a digital thickness reading. 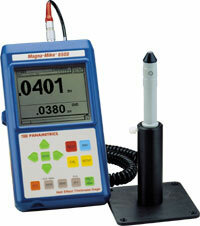 The unit's accuracy is ±1% and is not dependent on the shape or internal properties of the test material. Its non-destructive measurement features allow pinpoint thickness readings in tight corners and grooves down to a radius of 1/32 in. The device can measure the center of large parts and its display simultaneously shows the thickness measurement as well as the lowest thickness reading. Other features include a file-based datalogger that stores up to 95,000 readings, an RS-232 communication port for data output, and backlit LCD with large numerals for easy reading. In addition to use with non-ferrous materials, the Magna-Mike can be used in plastic packaging applications as well as with glass containers and composites.